So immediately I think, “this doesn’t look like company material,” so I pick it up and read enough of it to verify my first inclination: that it was left by a kook. It basically told how people shouldn’t buy and sell and what-not on the Sabbath (that’s Saturday, in case you’re late for class) for fear of disobeying and incurring the wrath of almighty God. Prepared to dismiss this as mere ramblings, it came rather quickly to mind how I’d been in a discussion a few weeks ago with a co-worker concerning Seventh-Day Adventism and whether or not it was a cult or just a weirdly faceted denomination. And I then realized that the subject and study of Sunday worship and why we do it really doesn’t come up that often. Finally, the fact that putting requirements on salvation aside from faith in Christ is nothing short of what Peter calls “damnable heresies” (2 Peter 2:1) really torqued my screws. Therefore, it sounded like a perfectly good subject for this particular online semi-monthly yap-fest. However, the paper didn’t stop there…it included all the feasts and convocations prescribed in the Pentateuch, mistakenly citing scriptures such as Nehemiah 10:29-31 and Isaiah 56:1-8. It even goes so far as to misquote Jesus Himself regarding the treatment of the Sabbath by the Jews of His day. Why this is mistaken will be covered later in a sweeping condemnation whose reasoning is so simple and directly supported in scripture as to be elementary and illustrative of why armchair theologians receive little respect. Moreover, the paper refuted the fact that “the Lord’s Day” in the New Testament is a reference to Sunday, but to Sabbath…that Christians having their meetings on Sunday was an invention of the Roman church in councils hundreds of years after the events mentioned in the New Testament as a continuation of pagan ritual. This is demonstrably false, as well. The simple fact of the matter is settled in Romans 6:14b, where Paul asserts, “ye are not under the law, but under grace.” While many mistakenly assume this means that the law is of no effect and immaterial to the Christian life (the technical term being “no way, Jose!”), this is saying that salvation is not dependent upon our ability to keep the law, but exclusively on the grace of God revealed in the death, burial, and resurrection of His Christ. It’s certainly still the schoolmaster of the pupils of the Kingdom, but the pupils are now found as heirs of the King and therefore subject to the schoolmaster’s discipline and direction but not his condemnation (see Galatians 3:23-25). But further, in examining the cited scripture, it’s not even talking about the Church. It’s talking about Israel. And regardless of what you believe (in my view, supercessionism/replacement theology is a bankrupt theological position), God refers to His special people, the Hebrews, when demanding adherence to the letter of His law. The cited verses are misapplied…Gentiles such as myself do not fall under those stipulations. Why don’t we? First, there’s the fact that we’re under grace. Second is the position of the keeping of the Sabbath within the moral code of Mosaic law…specifically, it’s not in there. It’s in the very point of the Sabbath as a day of rest: is it possible that God was exhausted from His creative effort, and commanded men to do the same, to prevent them from out-doing Him? This is ridiculous, and the Lord Jesus Himself stated in Mark 2:27, “the Sabbath was made for man, and not man for the Sabbath…” It is for the well-being–both physically and spiritually speaking–of God’s chosen people that He gave them a day of rest from their labors and an opportunity for reflection upon the One who created them. Plus, it figures in heavily with the framework of the Jewish sacrificial system and its observation. Another way we see that the Sabbath is not part of the moral law is in which laws were reinstituted in the New Testament. Matthew 22:37 covers the first three. See Matthew 19:18-19, where we see the sixth, seventh, eighth, ninth, and fifth. Then see in Romans 13:9 the tenth. Where’s #4? Not in there. Finally, we see how, in Romans 2:14-15 how even the Gentiles recognize God’s moral law, which is inherent in the heart of man. How, you may wonder? You can talk to people from any time and any place about how certain things are wrong (excluding those matters that have been “seared [as] with a hot iron”, re: 1 Timothy 4:2). But you can’t talk to them about keeping a Sabbath…it’s totally foreign. Why? Psalm 147:19-20a tells us that “He sheweth his word unto Jacob, his statutes and his judgments unto Israel. He hath not dealt so with any nation: and as for his judgments, they have not known them.” It’s why God never condemned the nations for not observing the Sabbath…He never told them to! Don’t forget those years between creation and the giving of the law to start with. Also, in Acts 15, the Jewish council did not enjoin the Gentile believers to observe the Sabbath, and Paul forbade such later in Romans 14:5. A reading of the letter to the Galatians should be more than sufficient to clear things up. Like Helen of Troy was the face that launched a thousand ships, this misunderstanding has, over the years, launched a thousand heresies that continue to this day. It’s how legalists have discouraged believers from enjoying and utilizing the liberty that is theirs in Christ (Acts 15; Galatians 5:13) and how aberrant religious groups/cults have captured converts in the millions and left their heads buzzing and hearts rigid and hard. Where “the Lord’s day” is concerned, the Sabbath is no longer treated as a requirement in the New Testament, having been eclipsed by our rest in Christ (Hebrews 4:9-11, Colossians 2:16-17). Those scripture passages, along with Romans 14:5-6, all but destroy the concept of God’s Sabbath prescription of a set time, place, and cause for worship. Christ’s resurrection and triumph over death, hell, and the grave is celebrated on the same day on which He arose…the first of the week, Sunday. A new tradition arose and is plainly seen in Acts 20:7, where the believers were gathered together on the first day of the week for the Lord’s supper and preaching. Furthermore, Paul exhorts believers in Corinth to take offerings on the first day of the week (1 Corinthians 16:1-2). And it bears mentioning that Sunday worship does not “replace” the Sabbath, as the Sabbath simply doesn’t matter for the non-Jewish Christian for reasons that should be abundantly clear. Finally, in Revelation 1:10-11, where John writes that his vision of Christ occured “on the Lord’s day”, it’s clear that the Church was typically meeting on Sundays by this time and the construction of the phrase in Greek is unique to scripture, and is likely not describing a Sabbath day. As said by Peter, Jesus Christ is our Example (1 Peter 2:21). He worked on the Sabbath, including putting food on the table (Luke 6:1-5). Working or doing business in the modern world is not so different. Telling me I can’t work on Saturday because God said not to is ludicrous, and I hope no one pins their hopes of eternal life on meeting the demands of the law. It’ll never work…there’s only one way. Thanks to Matt Slick, Dave Hunt, and John MacArthur for giving me a really, really good place to start. It helps when someone else has already done the heavy lifting! Exactly right. I’ve editted the post with a video from Bro. Adrian Rogers on the subject that sums it up quite nicely. Also, the comments on that video are pretty weak. It’s a six-minute clip of a 40+ minute message. If not seen it in totality, there’s very little basis to nitpick it. But it begs a question as to whom I should trust: a learned and blessed pastor with the anointing of God on his life and ministry, or keyboard theologians betrayed by their obviously superficial understanding of God’s Word? Every day is holy to God, and it’s up to us to work towards living up to His standards on each one, not to achieve salvation but because we already have it through grace. God from the start used Israel for the safeguard of His laws. Evey author in the bible was a Jew. Paul says all scripture was wriiten by inspiration of God. So the law of God if not Jewish despite the fact that God entrusted them wt His law. The law of God (wc includes the Sabbath) was there at creation. If not why did God destroy men when they sinned by flood, what was wrong with Cain killing Abel n Joseph sleeping with Portipher’s wife. Gods law is ertenal – Christ says its easy for the heavens and earth to pass away than for His law to pass away, even the tiniest part of it.We dont decide what we take or dont take in His law. FYI, Joseph never slept with Potiphar’s wife. Also, Abraham didn’t observe the Sabbath. He was never commanded to, either. Neither were Gentiles…which is why the apostles in the book of Acts concluded through the direction of the Holy Spirit that Gentile believers did not have to become Jewish (oh, BTW, are you a Jew?) before they could be saved. We get God’s grace on the same basis as Abraham: through faith. Not our adherence to a law not directed to us, a fact illustrated quite clearly in the institution of the Passover. Now, God’s law is, as stated in Romans 7:12, “holy, and just, and good.” Just like God. As such, only God can follow it. So you keep on trying to live up to His example in hopes that it’ll be enough, and I’ll keep on trying to live up to it because I want to…all the while having peace in His accomplished work and His continuing rest. And if you don’t want to listen to me, read the first half of the book of Romans, particularly chapters 4-7. Malachi 3:6 for I the Lord do not change. 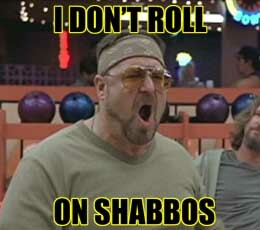 If you’re a Jew, you should keep the Sabbath. Otherwise, follow your conscience but realize that there are many feasts and sacrifices that are part of keeping the law as well. Do you as a good legalist do this? Why, or why not?